This richly illustrated monograph is the first book about the German graphic designer, commercial artist, architect, and poster and book designer Wilhelm Deffke. 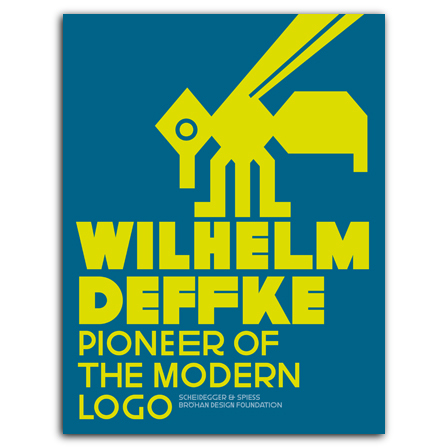 Born in the German Rhineland in 1887, Deffke is considered one of the pioneers of modern corporate design. Although termed the “Father of the Modern Logo” by the US critic Steven Heller and indeed known to insiders on an international level, only a fraction of his designs have ever been shown. Wilhelm Deffke’s work is now being presented to a broader public for the first time. Fourteen essays present the wide-ranging aspects of Deffke’s work within the context of the development of design in Europe, and more than 500 images illustrate his pioneering achievements in the field of poster and commercial art, including his over 10,000 company and product logos in particular but also designs for exhibitions and trade fair stands. The book offers the opportunity for the long overdue rediscovery of an exceptional artistic personality. , Berlin, has been established in 2005 by the collector and design researcher Torsten Bröhan. Its goal, among others, is examining the overlooked designers of the 20th century. is an art, architectural and photo historian and a researcher who lives and works in Hamburg and Berlin. He has published widely on twentieth-century art, architecture, and photography.